Baseball hats are common accessories for children, men and women of all ages. The hats show support for favorite teams, alma maters and favorite rock bands. They are also used to keep the sun out of your eyes and off your face. Baseball caps can become dirty and wrinkled pretty quickly. But, a quick trip to the washing machine can remove all those wrinkles and have your hat looking as good as new. Check the label of your baseball cap for cleaning instructions. Make sure your hat can go in the washing machine. Older caps made of wool will most likely need to be washed by hand. Test an inside area of your hat for color fastness using the detergent you plan to use in the machine. Take a small amount of the soap and rub it on the inside of the cap. If the detergent changes the hat's color, you will need to try another brand. Spot clean any particularly dirty areas with a product like Spray and Wash. Spray the cleaner on the affected area and follow the product's instructions regarding how long to let it sit. Place the hat on a plastic hat form. These can be purchased at most stores that sell hats. The form will help your hat retain its shape in the washing machine and will really help cut down on wrinkles. Wash the hat in a regular cycle in your washing machine. You can include other clothes in the load if you like. Remove your hat from the washing machine and let it air dry. You will want to keep the hat on the plastic hat form during this process. Smooth away any wrinkles in the fabric using your hands. Start in the center of the hat and move your hands towards the sides, pressing the wrinkles away. Do this before the hat is completely dry. 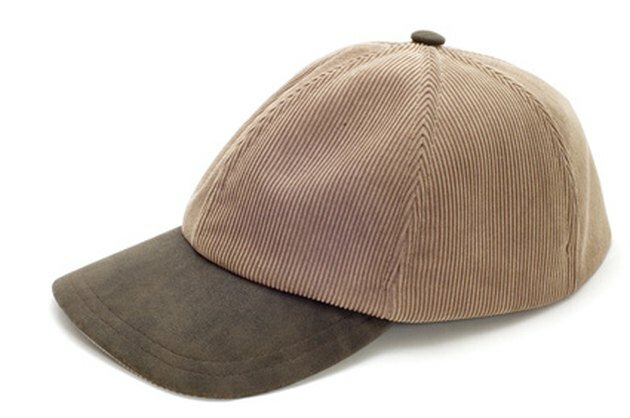 Spray the area of your hat that is most prone to wrinkles with spray starch and smooth the fabric with your hands once again. Do this when the hat is about half dry. Once you have used the spray starch, take a hair dryer and dry the area where you applied the starch. The heat will help the starch set. Once the cap is dry, remove it from the hat form. Use a light touch with the spray starch. If you use too much, your hat could end up wrinkle free, but also very stiff.